While first published over 10 years ago, I am now reading “The Power of Now” by Eckhart Tolle. A few years ago I glanced at a friend’s copy and tossed it aside as fluff. I wish I could remember what inspired me to read it now. What an amazing book. If you have yet to read and want to find peace in your life, I highly recommend it. In essence he’s letting is know that only NOW can we change anything, do anything, feel anything, experience anything. Everything else is either in the past or in the illusion of the future. It comes down to being aware, conscious NOW. It’s a tall order and by far the most difficult thing for me to do. Often I find myself mulling over something that happened in the past or trying to imagine a future event or conversation…all the while missing what’s going on right NOW. The paradox is that when we are aware of this mind chatter, that’s when it stops. He also tells us that in any given now we have three options: 1) walk away, 2) change something, or 3) accept where we are. Then in the next now we can re-evaluate our three options. Our reward for this awareness? Peace. It’s remarkable. Every time I catch myself, I calm down, my mind becomes quiet, and I have a few moments of peace. I’m learning that this requires diligence and each time it becomes easier. 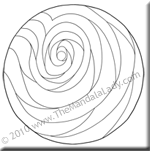 As you color this month’s mandala see if you can stay in the present moment, enjoy the process of coloring for the sake of coloring, letting go of the outcome. Thank you, Marie. I’m glad you found it helpful. You art is quite beautiful. Keep it up!